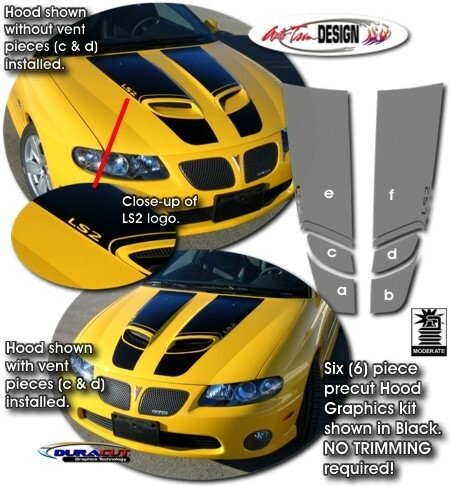 Make your Pontiac GTO or Holden/Vauxhall Monaro/VXR8 "Tough-looking" with this awesome Hood Graphics kit. This easy-to-install kit is packaged as a set of six (6) pieces with or without "LS 1" or "LS 2" badging uniquely cut into the graphic as shown. 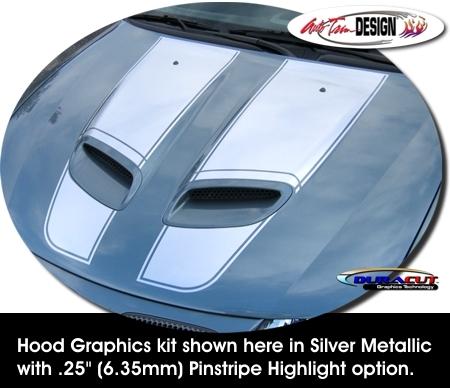 This kit is specifically made for the '05-'06 Pontiac GTO or Holden/Vauxhall Monaro/VXR8 with factory Hood Vents as shown and will not fit any other vehicle. Graphic spacing at front of hood is 5.5" (139.7mm) and 7" (177.8mm) at the rear of the hood. 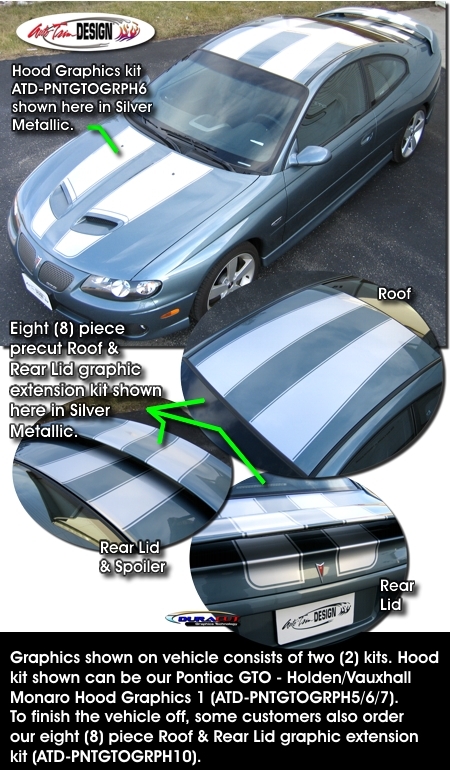 Extend this unique graphic over your vehicle's roof and rear lid with our easy-to-install eight (8) piece precut extension kit. Following the tapered shape of the Hood Graphics, the roof pieces gently narrow to the rear and come together onto the rear lid and spoiler areas. Center spacing shall be set as per our ATD-PNTGTOGRPH10 Parts List at time of installation. Pinstripe Highlight, if selected, consists of a .25" (6.35mm) pinstripe at outside edges with .25" (6.35mm) spacing.